There’s no doubt the Corvette, even though a 2-seat sports car, was one of the meanest muscle cars on American streets during the 1960s. The high-revving small-block Chevrolet 327 CID V8 along with the monster big-block 427 CID V8 solidified the Corvette’s performance reputation during that time. Unfortunately everything changed in the 1970s, Chevrolet’s big-block 427 had grown to 454 CID but with new government regulations and the 1973 Middle East oil crises, it was living on borrowed time. The 327 had grown to 350 CID by the late-1960s, it had to step up and become the Corvette’s top performance motor in the 1970s. The top performance 350 in the Corvette for 1970 was the LT-1 V8 which produced 370 gross horsepower (in the Corvette) which was mighty impressive for a muscle car motor especially a medium displacement small-block – it had more than the coveted one horsepower per cubic inch of displacement. It was only 20 horsepower less than the LS5 454 CID V8 which was the Corvette’s top performance motor for 1970. The LT-1 350 stuck around for two more model years unfortunately its compression ratio was lowered for 1971 to meet new unleaded fuel standards. And horsepower for 1972 was now listed in the more stringent newly mandated SAE "net" standard versus the former "gross" so the LT-1 for 1972 was listed at 255 net horsepower. Not bad considering the times and the LT-1 was almost as powerful as the 1972 Corvette’s top motor – the 454, which now was rated at 270 net horsepower. The 454 would stay around for another two model years unchanged and then would be retired for good as a Corvette option at the end of the 1974 model year. The LT-1 had enough brawn to carry the performance torch for the Corvette however there was one big problem, 1972 would be its last model year. The Corvette’s base 350 V8 for 1973 was the L48 which had dropped to 190 horsepower. The brawny 270 horsepower 454 was still around but it was nearing retirement, so Chevrolet decided to introduce a new performance 350 (5.7 liter) V8 called the L-82 (also referred to as RPO "L82" in some Chevrolet literature). 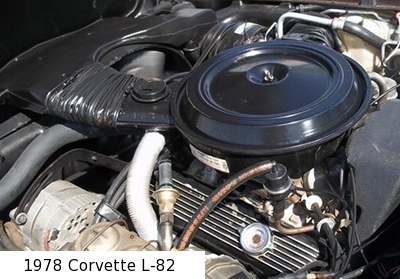 Initially just like the LT-1, the L-82 was to be a performance motor for the Corvette and Camaro Z28. It served that duty well. Where most low-compression high performance motors of the 1970s had compression ratios in the 8.0:1 to 8.6:1 range, the L-82 had a 9.0:1 compression ratio which was high by 1970s standards where 91 octane gas was as good as it got. However it was low compared to the 1970 LT-1 which had a 11.0:1 compression ratio. The L-82 had high performance cylinder heads which had 2.02 inch intake and 1.60 inch exhaust valves. The L48 had smaller 1.94 inch intake and 1.50 inch exhaust valves. Where the L-82 also differed from the L48 was it used a more performance oriented camshaft which was taken from the 1969-1970 L46 350. This camshaft had an intake duration of 346, exhaust duration of 360, a intake lift of .450, and an exhaust lift of .460. The L-82 also had a free-flow dual plane cast iron intake manifold and forged aluminum pistons. Unlike previous small-block high performance Chevy V8s which used high-performance Holley 4-bbl carburetors, the L-82 had a 750 cfm 4-bbl Rochester Quadrajet. All L-82s had a four bolt main 350 engine block whereas the L48 was a two bolt main block. 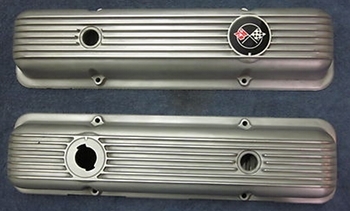 Also included with the L-82 were the LT-1’s attractive finned aluminum valve covers (in later years these L-82 valve covers would be painted black). 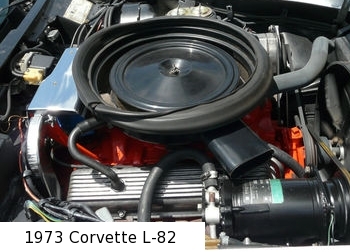 The 1973-1975 Corvette equipped L-82 had a dual snorkel air cleaner assembly that also accepted cool air from the hood’s cowl induction setup. With cowl induction, the L-82 at full throttle made that beautiful sound all muscle car fans at the time loved. Starting in 1976, the L-82 would no longer have cowl induction and used a more traditional dual snorkel air cleaner assembly. The L-82 was the Z28’s only motor for 1973-1974. When the Z28 took a short hiatus and returned for 1977, the L-82 was only available on the Corvette. 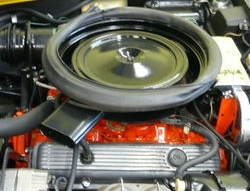 The 1973 Camaro Z28’s L-82 had the traditional performance open element round air filter assembly versus the 1974 the Camaro Z28’s L-82 which had a dual snorkel air filter assembly. The Z28’s L-82 was rated at 245 horsepower and 280 lb-ft of torque. Performance for the 1973-1974 Camaro Z28 which was equipped with a 4-speed manual, was very good for the times. Car and Driver (September 1973) obtained a (1/4) quarter mile time of 15.2 seconds and 0-60 mph in 6.7 seconds. It would take another 10 plus years before another Camaro would equal this performance. The 1973-1974 L-82 equipped Corvette was rated slightly higher at 250 horsepower and 285 lb-ft of torque. The Z28’s L-82 was detuned by 5 horsepower and 5 lb-ft of torque, not because of a difference in output but more than likely due to internal politics at Chevrolet – it probably didn’t want the lower priced L-82 Z28 documented as having the same output as the higher priced L-82 Corvette. Road and Track magazine (June 1973) test drove a 1973 Corvette with the 4-speed/L-82 combo and hit 0-60 mph in 7.2 seconds and the 1/4 mile in 15.5 seconds. Road and Track commented that the L-82 1973 Corvette was "one of the best Corvettes we’ve ever driven". The L-82 couldn’t have asked for better words of praise. And due to the L-82’s much lighter weight than the heavy 454 big-block, the 454 and L-82 were performance equals, Road Test magazine (June 1973) obtained from the 454 equipped (4-speed manual) 1973 Corvette, a 0-60 mph time of 7.5 seconds and a 1/4 mile of 15.5 seconds at 94.1 mph. By 1975 the L-82 was only available with the Corvette. New emissions standards were now mandated for all 1975 model year cars sold in America. This meant the addition of new emissions equipment to the L-82 – in other words horsepower robbing equipment. All the American performance cars that remained for 1975 suffered a deep drop in horsepower. Unfortunately the Corvette was no different, the L-82 lost 45 horsepower and was now rated at 205 horsepower. Strangely enough not many opted for the L-82 option this year – only 2,372 L-82 Corvettes were produced for 1975, the lowest production total of any year the L-82 was available. It’s odd that most Corvette buyers in 1975 would opt instead for the L48 instead which was rated at a paltry 165 horsepower – the lowest horsepower rating on any V8 equipped Corvette. Fortunately this would be a brief low point for the Corvette and L-82. Horsepower for the L-82 would bounce back to 210 for 1976 and 1977. Road Test magazine (June 1976) tested a 1976 Corvette with the 3-speed automatic transmission/L-82 combo which did the 1/4 mile in 15.2 seconds at 92.4 mph. And Road and Track (June 1977) obtained a 1/4 mile of 15.5 seconds at 92.5 mph with a 1977 Corvette equipped with the 4-speed manual/L-82 combo. For 1978 and 1979 horsepower would rise to 220 and 225 horsepower respectively. The big bump to 220 horsepower was related to a (new for 1978) plastic air intake which feed air directly into the L-82’s dual snorkel air cleaner. Also helping to improve power output was a new free flow dual exhaust/dual muffler system immediately behind the single catalytic converter. And for 1978 a new dual plane aluminum intake manifold replaced the heavy cast iron intake manifold. Road and Track magazine (April 1978) tested a 1978 Corvette with the 4-speed manual/L-82 combo and obtained a 0-60 mph time of 6.5 seconds and a 1/4 mile of 15.2 seconds at 95 mph. By the late-1970s the Corvette was one of the fastest American cars during this time period. The Corvette’s only serious competition at this time was from the (200-220 horsepower) 1977-1979 W72 400 CID V8 equipped Trans Am (and Firebird Formula) which averaged low-15 second 1/4 mile times. And to add salt to the Corvette’s wounds Hot Rod magazine (February 1979) obtained a 1/4 mile of 14.6 seconds at 96.67 mph with a bone stock W72 equipped 1979 Trans Am which happened to the be the fastest stock spec published muscle car time of the late-1970s. However Pontiac was cooking the books so to speak concerning horsepower, and the National Hot Rod Association (NHRA) called them out on it by rating the stock 1977-1979 W72 400 V8 at 260 horsepower. With that considered the Corvette battled the more powerful W72 Trans Am pretty well even with a whopping deficit of 50 cubic inches. And many Corvette buyers in 1979 were impressed with the performance – 14,516 L-82 Corvettes were produced for 1979 – the highest number of any year the L-82 was a Corvette option. However by 1980 the tables were turned, the L-82 Corvette was the undisputed performance champ since the Trans Am lost the W72 400 and was doing battle with a new 210 horsepower turbo 4.9 liter (301 CID) V8. And surprisingly when horsepower was way down across the board on most performance cars by 1980, the L-82 for 1980 was up to 230 horsepower – its highest rating since 1974. Unfortunately the Corvette would hit the brick wall for 1981 with the L-82 being dropped and replaced by the L-81 which was only rated at 190 horsepower. It would not be until the 1985 model year when the Corvette received a new Tuned-Port Injected (TPI) 350 CID (5.7 liter) V8, that the Corvette’s horsepower would be back up to 230. Unlike many other performance cars of the day Chevrolet didn’t advertise with a badge or decal the displacement of the L-82 in either cubic inches or liters – which was popular during this time. It simply put small "L-82" badges on each side of the center hood bump. However this was enough to let onlookers know this was no run of the mill Corvette. When you hear about the new 2013 Corvette 60th Anniversary Edition release right around the corner, you soon realize its been more than 30 years since the last L-82 Corvette was produced. With that said, the Corvette has since the first V8 was added to a Corvette engine bay back in 1955, always provided the best performance available in every decade since. Without the L-82, the Corvette in the 1970s – an era when most muscle cars bit the dust, would have just been another "has been". The L-82 kept performance going strong even during the terrible performance malaise of the 1970s. So when all the Corvette aficionados break out the champaign and celebrate sixty great years of existence for America’s two-seat sports car, be sure to remind them they need to give recognition to the L-82. Without the L-82 being available during a very difficult period for the performance car, performance could have died for the Corvette. And at this crucial time the death of Corvette performance may have put the Corvette permanently out to pasture – and with that there may never have been a 505 horsepower 2013 Corvette 60th Anniversary Edition. We have the L-82 to thank for this not being the case – in its day the L-82 was a pretty amazing performance motor.